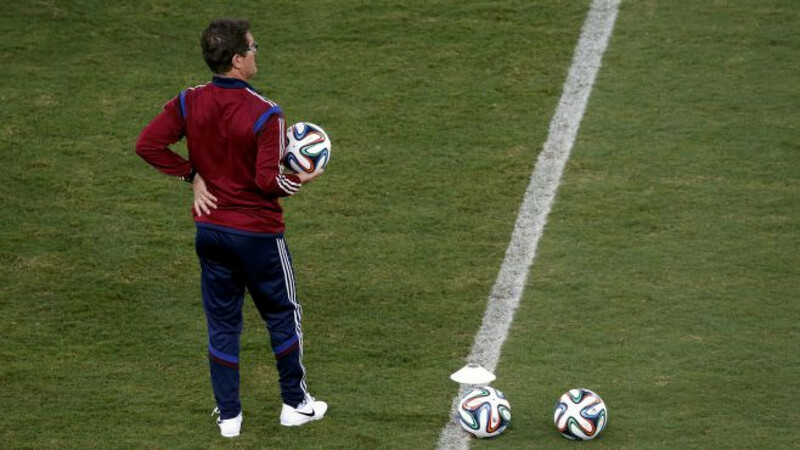 Russia's national soccer coach Fabio Capello holds a ball as he watches players stretch during a training session in the Pantanal arena in Cuiaba, ahead of their 2014 World Cup Group H soccer match against South Korea. Frank Lampard's 'ghost goal' against Germany at the 2010 World Cup still does not sit well with Russia coach Fabio Capello, who said the positive impact of goalline technology's introduction was already clear to see in Brazil. Capello, a former England coach, lamented the fact that the technology was not available to him four years ago when Lampard's shot hit the underside of the bar and came down behind the German line but the goal was not given by the referee. England, 2-1 down at the time, went on to lose the second round clash 4-1 and were knocked out of the competition. On Sunday, France became the first team at a World Cup to be awarded a goal using the technology when their second goal in a 3-0 win over Honduras was confirmed by the GoalControl system. "As you saw yesterday, the experts know what a great difference that is," Capello told reporters on Monday. "We paid the price for the technology that's now out there." Capello, who will be in charge of Russia through to the 2018 finals on home soil, is confident his team are ready for their Group H opener against South Korea at Cuiaba's Pantanal arena on Tuesday. "I'm convinced we've worked hard and done everything to come to this opening (match) in top physical condition," the Italian said, adding that his players had already prepared for the hot temperatures in Cuiaba. Capello said he wanted his team to play with intelligence and personality. And after his side's 2-1 win over their rivals in a friendly in Dubai last November, he felt the Koreans would spring no surprises. "I think we're well informed and on top of that we've already played them and got to know them," he said. "It's not important to know their names but the characteristics of the players is most important to prepare properly to get to the match in excellent conditions." Capello has named defender Vasili Berezutsky his captain rather than midfielder Igor Denisov for Russia's first appearance at the World Cup finals since Korea and Japan co-hosted the tournament in 2002. "Igor is a leader on pitch but Vasili speaks English and communication with the referee is very important," he said. Argentine Nestor Pitana will be in charge on Tuesday. "It's important for Russia playing in the finals for the first time in 12 years, we need the experience to understand the top level in football (today) to prepare for the Euro (in 2016) and the World Cup at home."